In order to become a match to the things that we really, really want in our lives, we first need to vibrate like them. That means we need to somehow come into the same energy or frequency as them. My Law of Attraction teachers, Esther and Jerry Hicks (via the teachings of Abraham) have many processes that will help us do this. Right now I’d like share one of those processes with you – a deceptively simple one called ‘Positive Aspects’. 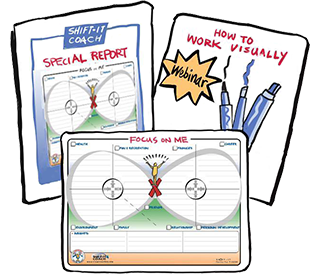 And, as I’m a ‘graphic coach’, I’ve created a visual map to aid you in doing this, so you can even more deliberately focus your thoughts and feelings. In any life situation, or in any person, place, thing, etc there are good or positive aspects and there are bad or negative aspects. The trick to effective Law of Attraction work is to habitually get yourself focused on things that feel good (i.e. the positive aspects). Unfortunately, not all of us are habitually good thinkers – some of us (like me) need training wheels to teach us how to do this. We first need to learn how to deliberately focus our energy and, with practice, our efforts eventually become habits. Why Focus on Positive Aspects? Focusing on positive aspects is one of the many ways we can consciously begin to flow our energy wisely – to effectively harness the Law of Attraction so it benefits us (rather than works against us). The Law of Attraction is relatively simple at its roots – you get what you most focus on. If you focus on negative things, you are going to feel negative (and your feelings are going to kick in and start vibrating at that frequency – and attract more of the same). However, if you focus on positive things, you are going to feel positive (and your feelings are going to kick in and start vibrating at that frequency – and attract more of that energy). Obviously this is an over simplification – there are many, many feeling tones between just strictly negative and just strictly positive. But the general concept is, the more positive you can focus, the better you will feel (and the better your vibe will be broadcasting out in the world for like to attract like). A vibe is a vibe. It doesn’t really matter where you find a good feeling vibe – the important thing is to milk it for all its worth! One way to apply the Positive Aspects Map is to use it generally on your life or a broad situation. You deliberately cast around for positives, in a general sense, that make you feel good when you think of them. It might seem simple (and it is) but doing this simple exercise will raise your vibe and make a difference in your experience (in the present and in your future to come). 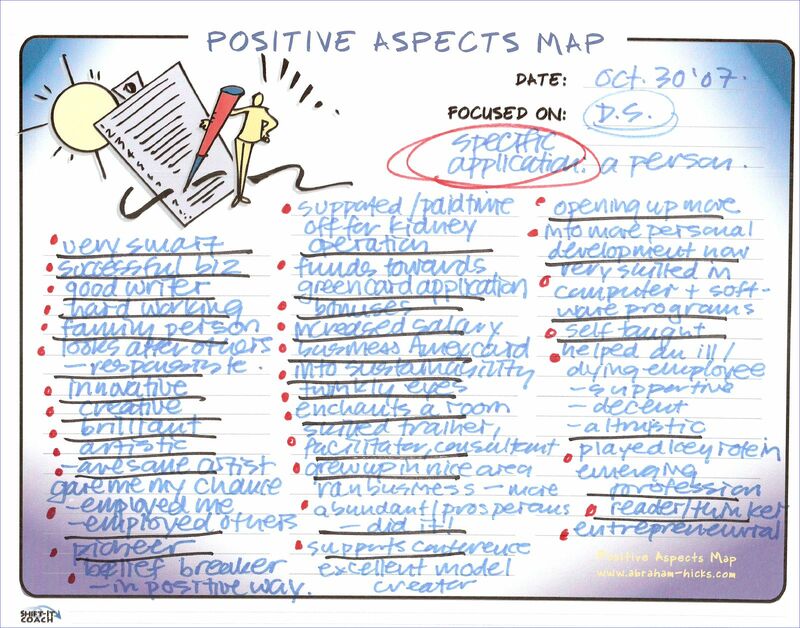 Below is an image of a positive aspects map that I have used to list out positive aspects of my past (this is an example of using Positive Aspects generally). By going through the process of creating this map, I have forced myself to cull out things that make me feel good. I have in effect deliberately milked a positive vibration out of myself. I have SHIFTed my vibe (at least a little tiny bit – and the tiny bits count in LOA work!). You can do the same! A more advanced application of the Positive Aspects process is to focus specifically. For example, on a specific person, place or thing. This application is very effective for slightly (or even majorly!) shifting your energy on that specific ‘it’. It could be something that you already feel good about (and want to continue to beat that positive drum about so you continue to get more of the same). Like a romantic relationship that is working well and that you want to keep pre-paving good energy about. Or, it could be on something that isn’t going the greatest and you want to “SHIFT-IT” so the energy around it feels better. For example, on a person who tends to be problematic for you and that you want to feel better about and possibly attract better things from. By choosing to deliberately focus on the positive aspects of this person, place or thing, you are pumping up the positive side of the equation as opposed to the negative. In effect, slightly (or majorly) changing your habitual ways of relating. SHIFTing your vibe, so to speak. The trick is, you legitimately have to find things that you can honestly feel good about – that you can authentically appreciate. There is no way to really trick energy, it either feels good or it doesn’t. Write what feels good on your map and skip the rest! As Abraham says, you need to develop the habit of being a ‘selective sifter’. This non-physical work can have immediate effects as YOU begin to feel better just by changing your focus — and the cool thing is that often the reality of your interactions with this person changes too (somehow their greater senses pick up on the shift in you and there is more ‘wiggle room’ in the relationship for better things to occur). Ok, have I convinced you on the merits of using the Positive Aspects process to raise your vibe?! Sometimes the best way to learn the benefits of something is to experience it for yourself. 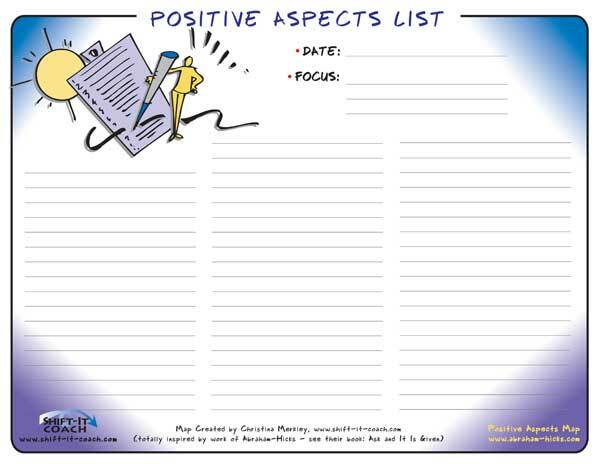 Below is a link where you can download The Positive Aspects Map file – so you can print it out and use it yourself. Experience for yourself the power of this process. Remember, your job is to hunt around and find the legitimate positive aspects of whatever you want to focus your map on – if it doesn’t feel good, it isn’t a positive aspect. So keep hunting until you find one, and repeat that process until your map is filled. 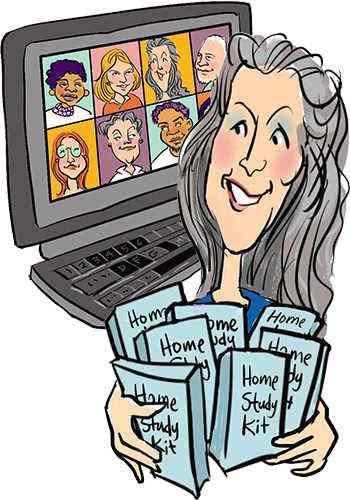 On some subjects this can be tough going to begin with, but the shift is well worth the effort – its not called SHIFT-It ‘work’ for nothing! You do need to put effort (at least at the beginning) into LOA work to get things working for you. This tool will help you apply LOA concepts in a practical way. For more in-depth information on Positive Aspects and other powerful Law of Attraction methods, I suggest reading Abraham-Hicks book called Ask and It is Given (see list of full LOA recommended readings on my webstore).